A brand new UN report found a 90 percent probability that man-made greenhouse gases were responsible for the increase in the Earth's surface temperature over the last half century. Something that most Europeans have believed for a long time but has been still doubted in the USA. Wake up time, Mr. B?! The report is compiled by the UN International Panel on Climate Change (IPCC), an independent body composed of the world's top climate scientists. It says that "extreme and violent weather will be the norm by 2100", scary... The UN Environment Programme (UNEP) adds: "The pace at which finite natural resources are being lost could mean that the engine of globalisation may stutter and eventually run out of fuel, triggering potential tensions between nations and aggravating, rather than alleviating, poverty". The Picture shows the disappearing glacier of Mt. 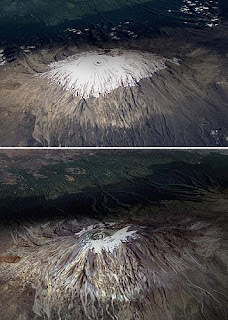 Kilimanjaro in Tanzania (courtesy of Spiegel). The top photo shows the peak in February 1993. The bottom picture is from February 2000. People on the bottom of the mountain rely on the water of the glacier, i.e. poor people are going die due to droughts. Take action! Here a good blog on Cimate Change Actions!